Geoff has developed a strong sales reputation in the region teaming with Landmark Harcourts as the Real Estate Specialist based at Keith. Geoff is driven by a admirable desire to uphold the highest ethical standards, utilise the latest marketing technology and works very hard to deliver the best possible results for his clients. Over the years Geoff has marketed and sold a broad range of real estate from grazing and farming to residential and commercial properties. Many well-known properties have been sold by Geoff ranging from $17,500 to $10,000,000+, several properties have even been sold by him 2 or 3 times. Geoff also specialises in auctioneering, property, livestock and clearing sales across the region. 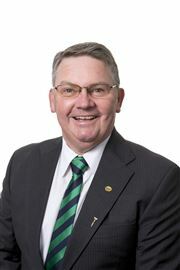 Geoff is currently selling properties from the Murray Mallee to Lower South East and everywhere in between covering approximately 19,500km2, regularly traversing between the Tintinara, Keith, Bordertown, Padthaway, Naracoorte and Mt Gambier Landmark branches. Great Location - huge block.